Cold brew is a method of preparation that uses cold water and time to produce a naturally sweet and less acidic beverage. When coffee is brewed using hot water the higher temperature releases acids which are otherwise muted in the cold brew process. Typically, cold brew is steeped for a 16-24 hour period. At Zingerman’s Coffee Company we are pleased to present an innovative and delicious product using the aforementioned elements. We use high quality, single origin coffees from South America and Indonesia, coarsely ground, then steep them for 16 hours at 42 degrees F. Zingerman’s cold brew coffee is a refreshing, caffeinated, ready-to-drink beverage that pleases the most discerning of palates. Our blend unlocks a powerful, well balanced, full- bodied beverage with a long finish with notes of rich chocolate. It is super smooth, sweet and refreshing. It is perfect for your morning brew or as an afternoon pick me up! It even tastes great heated up! Not to be confused with iced coffee! Iced coffee does not traditionally use a cold brew method of preparation. As the name implies, iced coffee simply refers to traditional brewed coffee poured over ice. What makes our Cold Brew the best? Zingerman’s Cold Brew Coffee is second to none when it comes to flavor. As cold brew coffee is less acidic than hot coffee, flavor is in full effect. 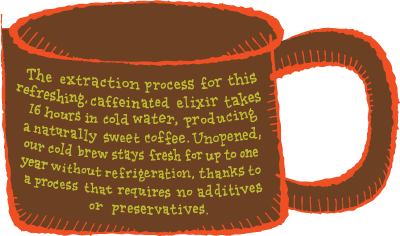 The patent-pending process of extraction used to make Zingerman’s Cold Brew provides for an exceptionally sweet and rich beverage with hints of chocolate. It is smooth, crisp, and refreshing. Beyond being thirst-quenching, Zingerman’s Cold Brew is highly caffeinated, providing an exhilarating boost. And better yet, just like hot coffee, our full-flavored cold brew has zero calories. Our smooth and refreshing beverage is perfect for the on-the-go, busy morning or as a quick, afternoon pick-me-up. Featuring a reclosable bottle and convenient, portable size, Zingerman’s Cold Brew can be taken nearly anywhere. While we are quite the fans of drinking Zingerman’s Cold Brew straight-up, there are numerous ways to drink or use this refreshing beverage. Use Zingerman’s Cold Brew in place of espresso in an iced latte drink or pour over gelato for a kick to your dessert. And of course, if you’re looking for something tailored to your liking, there’s always the option to doctor up our Cold Brew using good ol’ cream and sugar. Zingerman’s Cold Brew is an all-around great beverage for any time of the day. Whether it be your morning pick-me-up or an evening refresher, our Cold Brew won’t disappoint! Unopened, Zingerman’s Cold Brew Coffee is shelf-stable up to one year. Why is this important for you? Because our cold brew contains none of the additives or preservatives found in other beverages for shelf-stability. You can rest assured that Zingerman’s Cold Brew Coffee is free of any shelf-stabilizers whatsoever. Coffee and water are the only ingredients! Our goal at Zingerman’s Coffee Company is to make the coffee experience as welcoming as possible. We believe that coffee ought to be approachable and accessible to everyone! Our mantra, “full flavored, traditionally made” extends to everything we do. Our goal is to create a delicious, ready-to-drink, cold brew beverage for anytime and any reason. We could have produced and sold a product that required refrigeration along the entire path of the supply chain. Our customers told us it would be great if they could take it anywhere they wanted. That meant ruling out the use of stabilizers, additives, preservatives or acidifiers to ensure shelf-stability. Just coffee and water! We spent years researching methods and processes to produce a safe and delicious beverage. We also realized our extensive process research had lead us to something very special and submitted a patent. We won’t know the outcome of our application and submission for a while but we are excited to offer a great product in the meantime! Make our Cold Brew at home! We’ve already gone through our entire sample pack of @zingermanscoffee glass bottle cold brew. Coming soon to an Iorio’s near you! Want to learn more about our cold brew?